Course Website: Official Website - Visit 3 Creek Ranch Golf Club's official website by clicking on the link provided. 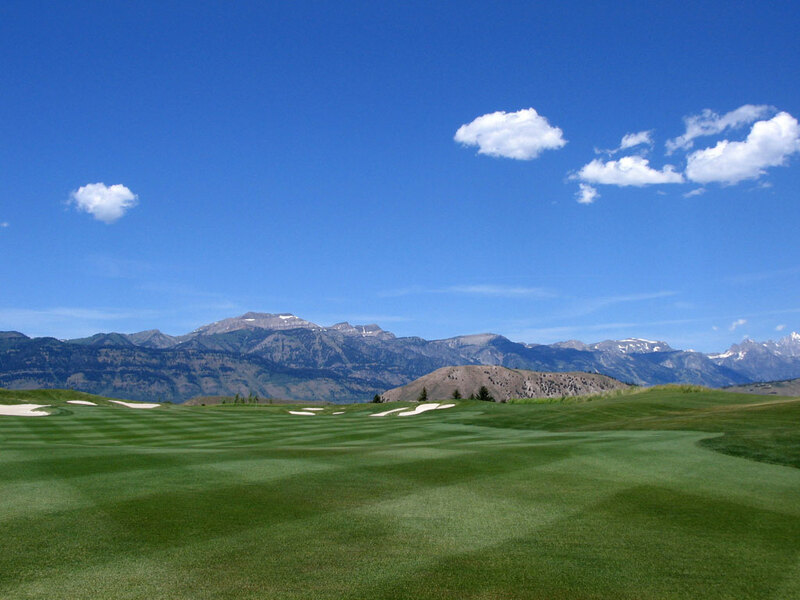 Accolades: Ranked 4th in Wyoming on Golf Course Gurus' Best in State list. 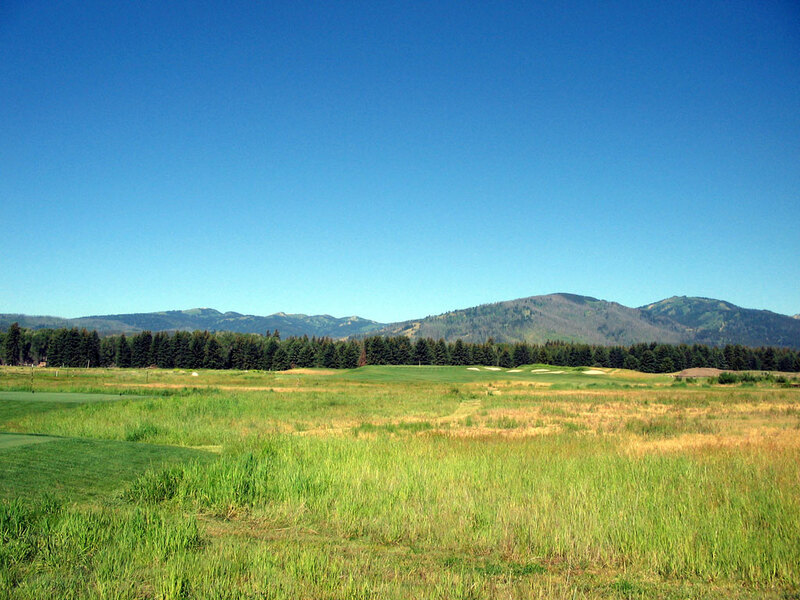 What to Expect: When a golfer finds himself in Jackson, Wyoming he expects the golf course he is playing on to deliver one critical thing; views of the grand Teton mountains. At 3 Creek Ranch, Rees Jones gives the golfer some peaks at the Tetons before fully featuring them on the stunning finishing holes. 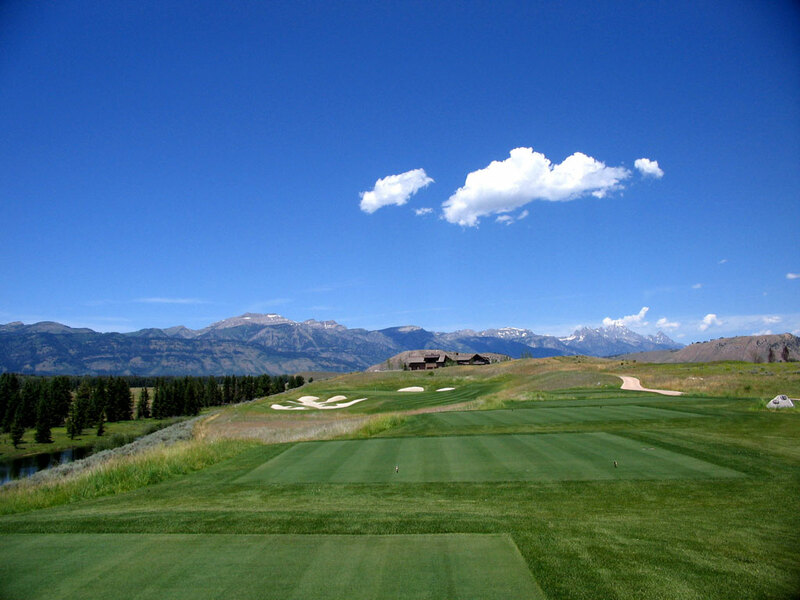 The private 3 Creek Ranch club features many things that high end clubs do, such as, an attractive clubhouse, stellar practice facilities, and perfect conditioning. However, 3 Creek Ranch has one feature that I've never experienced anywhere else; a new scorecard everyday. Each time you tee it up at 3 Creek Ranch they print out a scorecard that is applicable to that exact date and the precise pin placements and yardages that can be found on the course that day. No need for a range finder or GPS, just check your scorecard and let it fly. Rees Jones did what he does best at 3 Creek Ranch which is design a course with timeless strategies and not a lot of fluff. The course is challenging while still being fair and features some stunning views and plenty of water hazards and bunkers. Signature Hole: 17th Hole – 256 Yard Par 3 – Signature holes are often par threes, and 3 Creek Ranch is no exception. Measuring out to a stout 256 yards, the final one-shotter offers a mind boggling view with a creek below and left of the hole, perfectly manicured grass and bunkers leading up to the hole, and the Grand Teton mountains behind the hole. The terrain slopes towards the water, so there is more safety up the right side of this hole then the left which will also take the massive bunker left of the green out of play. It’s a stunning hole that embraces the elements that make Jackson Hole great! 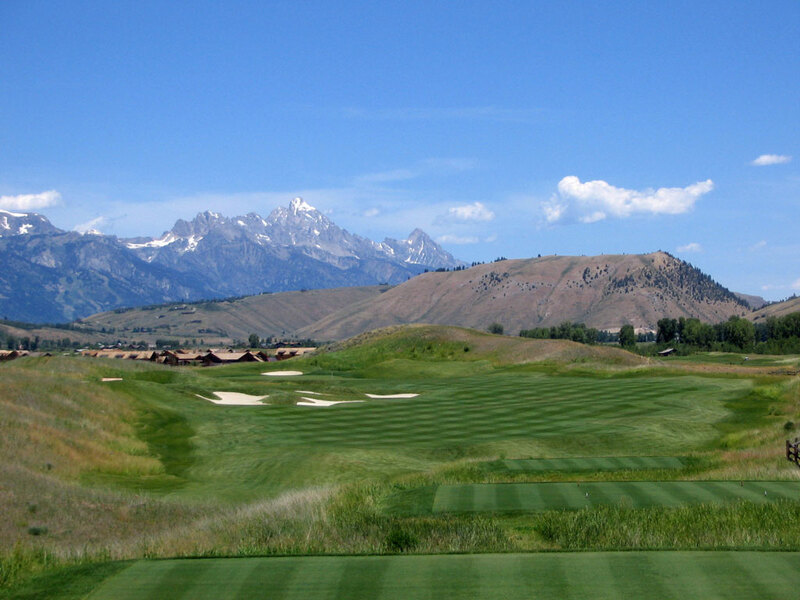 Best Par 3: 15th Hole – 240 Yards – This lengthy par three begins a wonderful stretch of finishing that starts by play away from the Tetons and is followed by three straight holes that utilize the Teton mountains as the backdrop. This hole plays from an elevated tee over a swell to a raised green. Sand protects the right side of the hole and can also prevent balls from cascading down the hill leaving a more difficult up and down then from the bunker. It is a stiff test, but at 240 yards it is shockingly the shortest par three on the back nine! Best Par 4: 16th Hole – 488 Yards – The final par four at 3 Creek Ranch offers whopping yardage and whopping views of the Grand Tetons. A collection of bunkers protects the left corner of this nearly 500 yard hole that will make you pucker if attempting to shorten the hole up with a bomb over the sand. Playing safely to the right lengthens the hole but also opens up the ideal angle into the green. A bunker behind the green is ready to catch approaches that fly too far, but hopefully by now you’ve adjusted to the thin mountain air and are dialed in. The Tetons in the background is nothing short of stunning. 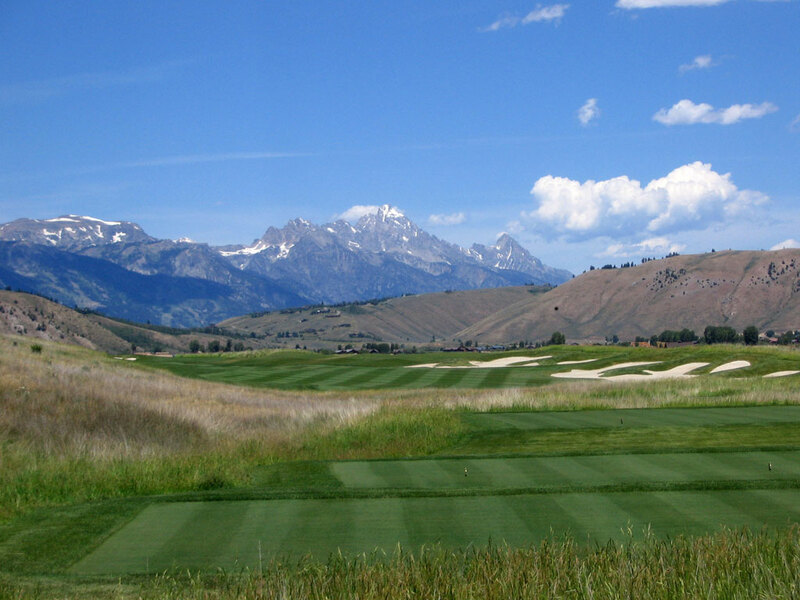 Best Par 5: 18th Hole – 629 Yards – Standing on the tee you are offered 3 Creek Ranch’s most impressive view of the Grand Teton mountains as they tower in the distance straight ahead of you beyond the fairway. A collection of bunkers are found on the right side of the fairway with a second complex of bunkers being found up further towards the green on the left side. At 629 yards it is a feat to reach in two, especially since it plays flat from tee to green and there is very little yardage that can be cut off. The green is heavily protected on the right with a complex of bunkers that are waiting to cause havoc one last time to your scorecard if precision fails you on your approach shot. Think like a soldier marching on this hole; start left, then hit to the right, and back towards the left. This will effectively take the bunkers out of play and should lead to a good score and good feeling on the closing hole. Birdie Time: 4th Hole – 337 Yard Par 4 – When you face a course as long as 3 Creek Ranch, you have to take advantage of holes that offer some reprieve which is exactly what the 4th hole does. At just 337 yards, some players will be capable of driving the green in the thin mountain air which will yield a nice eagle attempt. Laying up will still leave you with a comfortable distance to take dead aim at the flag with. The green is slightly raised and features bunkering on the right side of the hole while a pond awaits to the left of the green. Low hitters need to keep their tee shot airborne long enough to clear the fescue area located between the tee box and fairway. You have to take advantage of this hole because it only gets harder from here! Bogey Beware: 5th Hole – 521 Yard Par 4 – The natural thought when you see a 521 yard hole is that it must be a short par five, however that isn’t the case at 3 Creek Ranch. The 5th hole is a murderously long par four that boasts bunkers on each side of the fairway and o.b. if you hook it way left. Many players won’t be on the putting surface after two strokes, so it is best to favor the right side on your approach shot since bunkers protect the left side of the green. There is no way around it, this is a brutal four!